In recent years there has been a rediscovering of the music that has come to be known as Americana, music fully in the folk tradition of story telling and passing down of history backed by a melting pot of musical influences such as blues, country and Cajun for instance. And it is this music that has driven the music that develops through out the world, as for instance what would the Beatles and Stones done without skiffle which, as Billy Bragg points out in his excellent book Roots, Radicals and Rockers*, is the bedrock of British pop and rock music developed from blues, jazz and country music emanating from America. Americana has at times been somewhat forgotten, but at other times pre-eminent in developing the music we listen to. Today is one of those times as more and more Americana influenced artists develop with recently that music moving into huge stadium rock acts, the Kings of Leon being the main and most successful exponents at this time. 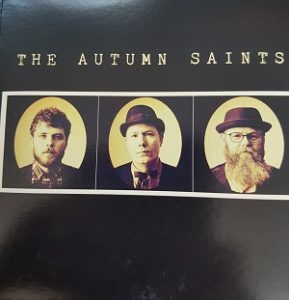 When listening to, for the first time, the six track self-titled album by Oxford based Anglo-American band The Autumn Saints, the laconic, sweaty, languid and slowly flowing rock of the Followill brothers, Caleb and Nathan, springs to mind. This is music that has a powerful but gentle ebb and flow, like the river that flows through Americana music of the southern states The Mississippi, this is muddy, dirty, strong and enormous music; you get caught in the current of these songs and you’ve got no choice, you’re going for a trip for which there is no known destination. Like the night Jeff Buckley took a swim in the mighty Big Muddy, you might not get out the other side; but by golly is gonna be one hell of a ride. There is so much packed into these six awesome tracks; maybe that’s the spirit of Tom Petty guesting on one of the songs, for sure I got a bit of Paul Simon’s Graceland being a touchstone, some of you may hear Dylan, Cash or Guthrie. It’s like The Autumn Saints have got together with an album collection of the very best music America has produced over the last 50 years so that they can put out something that pays homage whilst also taking the music in their own direction. And this is the true excellence of this album, for whilst North Carolian born bassist and lyricist Britt Strickland brings the authentic sound of the big country to this recording the influences that English guitarist, David Ireland, and drummer, Joel Brisk, bring to the music mix add an extra bit of Englishness; guitar melodies reminiscent of Johnny Marr and John Squire add to the overall majesty of this album. Americana music has always been a driving force in the music that develops in the UK, but UK musicians always find a way to take that music in different, interesting and rewarding directions. The Autumn Saints have put together here a six track offering of the very best in Americana music . Catch them live if you can. Visit their website (link below) to order the album and find out more. 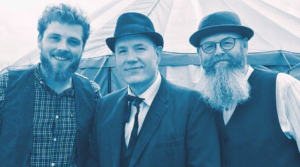 You will be rewarded by a fine swathe of Americana tinged country rock telling great stories that will take you, metaphorically, over the sea to the Appalachian mountains and the plains of the wide open spaces. This is an album that will spark or renew an interest in the cultural force that is Americana music. This is, in just six songs, one of the most immense records you’ll listen to this year.